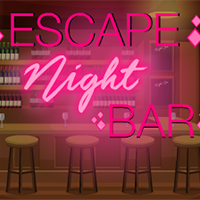 Escape007Games - E7G Escape Night Bar is another point and click room escape game developed by Escape 007 Games.Assume that you visit to Bar with your friends. Your friends went to home after visiting the Bar without noticing that you are still in the Night Bar. So use your skills to collect the necessary object and solve puzzles to escape from there. Good luck and have fun! heaps of very sneaky stuff first time around..
well, will mayhaps come back to this - still no luck with the sliders & I tried loads of combos...! haha - you beat me to it Yoshi - I should have refreshed the page! ah - missed a hotspot!